Earlier today we posted a link to a tournament NASA is holding. NASA is trying to crowdsource the organization of terabytes of data collected from missions all over the solar system. A few Hackaday readers wrote in (thanks [grbgout] and all the others) to tell us there is an International Space Apps Challenge going on this weekend to crowdsourse solutions to the problems of space flight. The challenge is the product of a partnership between NASA, the National Science Foundation, the UK and Japanese Space Agencies and a host of other organizations like GitHub, Yahoo Developer Network, and even a few hackerspaces. The idea behind the challenge is simple: spend a weekend solving software, hardware, and science challenges to improve the state of space sciences. There are a lot of interesting projects like programming an interface to a NASA mission simulator, figure out how to print 3D objects in space, and even develop the hardware and software for an underwater ROV. Aside from the fancy software and hardware challenges, there are also some very interesting data visualization problems, like clearly explaining the fact that space is mostly empty. If you can figure out how to tell people they aren’t the center of the Universe, take a shot at it – there’s probably a Nobel in Literature in it for you. Right now there are dozens of locations on all seven continents and in Low Earth Orbit (McMurdo Station in Antartica and the ISS) that will have people contributing to these projects. Of course you’re free to work out of the home and help scientists, engineers, and researchers reach to the stars. In a an obvious marketing move akin to a drug dealer offering up free samples, Urban threads is offering free badge plans for hackerspaces that have robotic embroidery machines. We’ve seen this trend of badges coming up lately and we don’t know if it is the boy/girl scout in us, or the punk rocker that makes us pine for them. You may laugh, but look at that skull with the welding goggles on. If you don’t think that’s badass… then we disagree. The idea of giving some away free isn’t new. You can download free photoshop brushes, free fonts, free circuits and all kinds of other free stuff from sites that sell better versions as well. We just couldn’t pass up the chance to point out that skull, and helping out hackerspaces is always good in our eyes. So, who has one of those embroidery machines? When [Andrea] was looking for a freestyle kayak, he bought the cheap version of a high-end kayak. The hull is exactly the same as the high-end model, but to differentiate between product lines, Pyranha chose to use less expensive fittings. [Andrea] decided to bring his new kayak up to spec (Italian, here’s a Google translation) by fixing the problems in the cheaper model by bringing it up to more professional standards. When [Andrea] got a hold of his kayak, the back rest was held on by a piece of nylon webbing secured with a plastic clamp. This was bound to fail after just a few outings, so he fixed this with a few steel nuts and bolts. The eyelets used to tie ropes to the kayak were terrible, so with a little bit of nylon webbing and a pair of buckles these were replaced. Now, [Andrea] has a very nice kayak indeed, for less than the price of the more expensive version. Good job, [Andrea]. [Chris] has allergies, asthma, and uses a wood burning stove. You can imagine why testing his air quality might be something he’d be interested in. He has a very nice $290 laser particle counter, but was really curious how the $12 sharp sensor he found would stack up. To find out, he plugged it into an arduino and started logging both on pachube. After a few different tests, like lighting a match, blowing it out, and letting the smoke flow into the sensors, he decided he needed something better. Cooking some pancakes turned out to be his ultimate method. After charting the dissipation of particles after cooking a nice batch of griddle cakes, he found the two sensors to be surprisingly similar. In the world of your dreams, you can build an entire world, an entire universe, an entire society governed by your every whim. While lucid dreaming you are a god in your own mind, free to create or destroy at will. You can train yourself to recognize when you are dreaming, but sometimes a little technological help can speed you towards the path of becoming an old testament god. [Will] over at revolt lab built a set of lucid dreaming goggles so he could take control of his own dreams. 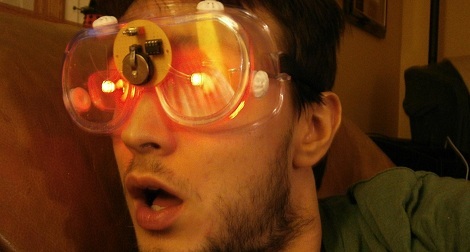 To induce a lucid dream, [Will] took a pair of safety goggles and attached red LEDs to shine into his closed eyes. A simple circuit was constructed out of an ATtiny85 that blinks the LEDs two hours after being turned on. The idea is these LEDs will be noticed by the user during REM sleep and they will realize they’re still sleeping. After that, it’s basically Inception. It is possible to induce lucid dreaming through psychological and not technological hacks; just asking yourself, ‘am I dreaming’ throughout the day may be enough to make a holodeck in your mind while you’re sleeping. You can check out a video of [Will] wearing his goggles after the break. The folks at the Louisville hackerspace LVL1 now have a fabulous piece of wall art that is also a speech synthesizer. The speech synthesizer is over two feet long and is made of nine panels of stripboard connected with right angle headers. An awesome piece of art if there ever was one. This speech synthesizer is actually 30 years in the making. In the early 1980s, one of the members of LVL1 across a few text-to-speech ICs in a bin in Radio Shack. These ICs sat in a drawer while college got in the way, and in 1990, the project was resurrected. The speech synth chips sat in a drawer for another decade, and it was finally decided to build a wall-mounted speech synth for LVL1. This speech synthesizer is intended to be the voice box for FATHER, LVL1’s second hackerspace AI. Already the first AI – MOTHER – is already telling people to take out the trash and generally trying to become the AI-gone-amok we all deserve. FATHER will be implemented in a robotic monkey, so right now the only question we have is who has been messing with the Louisville water supply. A few old timers may remember that once, long ago, computers didn’t require keyboards. The earliest personal computers such as the Altair 8800 and the server rack-sized minicomputers like the PDP-11 could be controlled with a panel filled with switches and lights, giving us the term blinkenlights. Today, most of these machines have been thrown away or locked up in museums and private collections; even if you were to get your hands on one of these control panels, you’ll have a heck of a time doing something useful with one. Fear not, because [Jörg] has come up with a great way to control these blinkenlights and simulate the computers of yesteryear. He calls his build BlinkenBone, and it’s able to control the blinkenlight panels from dozens of historical computers and simulate every thrown switch and tiny light bulb. BlinkenBone is a BeagleBone single board Linux computer running the SimH simulator for antique computers. Right now the BlinkenBone is able to simulate the PDP-1, PDP-8, PDP-11, a lot of old IBM machines, the Altair 8800, and even some HP boxes. Without a BlinkenBone or similar simulation device, the still-surviving control panels for these computers are just pieces of art to hang on a wall. When they’re running a simulation of their original hardware that was long-lost to the scrap yard, they become the useful devices they once were. Also, it’s much easier to appreciate how far technology has come in the last 40 years. You can check out a short demo of [Jörg] using his BlinkenBone on a PDP-11/40 after the break. Look at those lights go. lancebekistan liked TALON Omnidirectional EV. TraNguyenSeldat liked 3D-printable high torque servo/gear reduction. TraNguyenSeldat liked OPEN Power (Prototype 1). Walter liked Vintage film viewers as RetroPies. TraNguyenSeldat liked ODrive - High performance motor control.